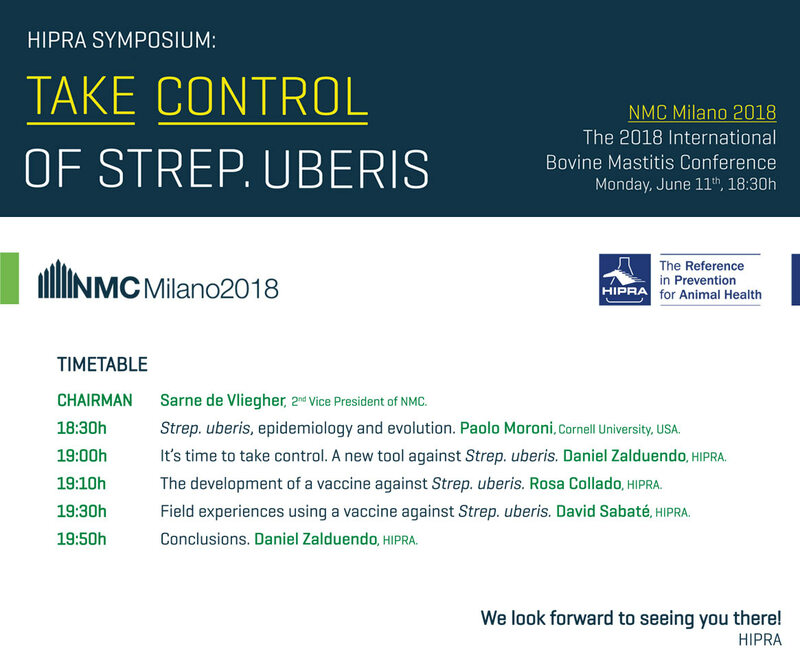 NMC Milano 2018: Take control of Strep. uberis with HIPRA! Hjem Nyheder NMC Milano 2018: Take control of Strep. uberis with HIPRA! The prestigious National Mastitis Council (NMC) is returning to Europe for the second time in its history. The event, which brings together world experts in milk quality, is to be held in Milan from 11th to 13th June and HIPRA will be Platinum Sponsor. For the occasion, HIPRA has prepared a series of activities, the principal one being the Symposium: "TAKE CONTROL OF STREP. UBERIS". This Symposium, which will take place on 11th June, is intended to provide a global view of the evolution of clinical mastitis caused by Streptococcus uberis bacterium, as well as offering a solution to this problem. Participating in the event will be Paolo Moroni (Cornell University, USA) who will review the history and evolution of mastitis in dairy cows and of its global prevalence. Daniel Zalduendo (Corporate Brand Manager Mastitis, HIPRA), Rosa Collado (Project Manager R&D Biological, HIPRA) and David Sabaté (Manager of Clinical Trials, HIPRA) will provide those attending with the opportunity of learning about the key to prevention of this pathology. A special participant in the event will be the 2nd Vice President of the NMC, Sarne de Vliegher, who will be responsible for leading the session. At the end of the Symposium, all those who have registered in advance (click here to pre-register) will be able to enjoy a dinner sponsored by HIPRA within the same University of Milan, during which they will have the opportunity of sharing their experiences and impressions following the technical session. HIPRA will also provide those attending the NMC with the opportunity of speaking with 8 world experts about subjects associated with mastitis in general and Streptococcus uberis in particular. Tine van Werven, Volker Krömker, Andrew Biggs… are just some of the experts that participants will be able to meet on the HIPRA stand during the congress coffee breaks on Tuesday 12th June. Another important aspect of HIPRA’s participation in the congress is the organization of 3 HIPRA University courses (already fully booked), which will be presented by international opinion leaders as well as the company’s own personnel, on Wednesday 13th June. With these courses, HIPRA continues to show its commitment to the continuing education of veterinary professionals and to promoting the recognition, control and prevention of mastitis caused by Strep. uberis. HIPRA, the reference in mastitis prevention, provides the whole world with the possibility of taking control of Strep. uberis.